The apartment is located at the Vila Marachique complex with AL License nº 47394/10/10. Situated on the 2nd floor of a 3 storey block. It has a large balcony with view to the sea and benefits from full sun in the afternoon and beautiful sunsets in the evenings. It is served by 2 lifts, stairs and intercom entry system. The apartment is well appointed with good self-catering facilities and is ideal for couples or families. 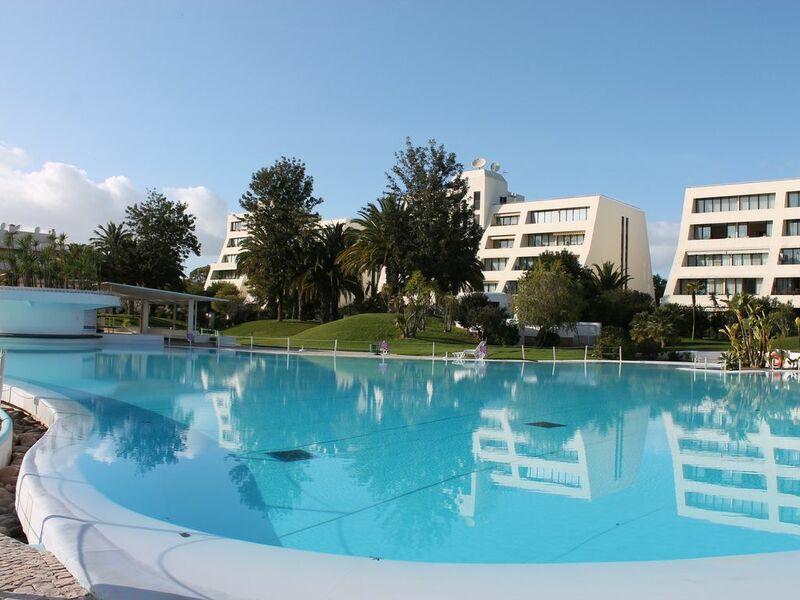 The complex has beautiful well kept landscaped and lush gardens in a 5 acre site with 2 large swimming pools. An ideal location with very good restaurants and bars, Alvor's beautiful long beach, charming fishing harbour, Town centre, Alto golf course, are within a short walking distance.Travelling to the nearby town of Lagos, Portimao, Silves, Ferragudo is very easy. Situated within easy travelling distance to entertainments such as Crazy World, Slide and Splash, Zoo Marine (swim with dolphins), Ten Pin Bowling, the Nature Reserve and Folklore evening. Fully tiled bathroom with bath/shower over, toilet, bidet and hand basin. Lounge/ dining room with table and 4 chairs, 1 sofa bed converting into 2 single beds, 2 armchairs, coffee table, side table, cable T.V. (32" flat screen T.V. ), DVD player. radio/CD player and air conditioning. Well fitted and equipped kitchen with hob (electric only), oven, fridge/freezer, microwave, toaster, electric kettle, iron and ironing board, utensils, crockery and washing machine on balcony. The apartment is approx 5 mins away from the Alto Golf and 10 mins to the championship course at Penina, Palmares and the new Morgado do Reguengo, Boavista, Silves, Pinta and Gramacho are all within a short driving distance. Golfers are spoilt for choice in this area! There is a golf shop close to the Venue bar at the edge of Alvor town were you can hire clubs or get repairs done or get some special course deals. Notes on accommodation: Cots and high chairs can be hired and welcome food packs can also be ordered for your arrival. Please note that smoking is not permitted inside the apartment but guests can smoke on the balcony. Outside: The complex is set within a beautiful well maintained landscaped gardens. The entrance to the apartment block has an intercom keypad system. Within the beautiful grounds is a large lake size swimming pool for adults and a very good size splash pool for children or babies (with non slip flooring for safety) the pool side has quiet areas for relaxing with sun loungers and sun shades, showers and toilets are on sight and there is a pool side bar serving drinks and snacks. Near the pool is a children's playground area with climbing frames. These facilities are exclusively for the owners and guests at the Vila Marachique. Relaxing is the key word and there is no noisy nightlife to contend with around the complex! Cleaning / Towels / Linen / Maid service: The apartment is fully serviced prior to your arrival. Linen and bathroom towels provided. A full clean and linen change is only provided mid-stay for lettings of two weeks and over. Beach/pool towels also provided. Other: In addition to the dining area, the balcony has a table and 2 chairs for extra dining and 2 sun loungers while having a very good view to the sea. An airer is provided for drying towels etc. Ausência de limpeza em estadias de uma semana! Propriedade excelente, mas pecam por não fazerem limpeza pelo menos uma vez em estadias de uma semana. Alvor beach is approx 5 mins by car/local transport or 15 mins walking distance from the apartment. One of the longest and safest in the area; it has clear sand,lovely rock formations and coves to the east side. Sand dunes beyond the harbour towards the bay of Lagos to the west. There are water sports, and lifeguards serve from April to September. Several good restaurants and bars are located along the beach. Praia de Vau, Praia da Rocha, Lagos, Praia da Luz are a short driving distance away. Alvor is approx. 45 minutes from Faro airport by car on a very good tolled motorway. You can get a Taxi or Minibus transfer, also check "resorthoppa.com" for cheaper transfers. Local bus stop in front of the complex serving the village and there is a very good local taxi service. Many low cost airlines fly into Faro. Alvor 1km. Portimao 5kms. Praia da Rocha 5kms. Lagos 24kms. Faro 65kms. Booking Notes: Email confirmation of booking is required along with a non returnable deposit of 20% of the rental to be paid within 5 days of confirmation. The remainder is to be received 8 weeks prior to the holiday. Upon receipt we will forward on to you, detailed driving instructions from Faro airport to where you will be met by a lady who will show you to the apartment. Changeover Day: Open according to bookings. Arrival 2pm, depart 10am (this is flexible and is dependent on bookings before and after). Notes on prices: Winter Lettings: November to February lettings have to be for a minimum of 2 weeks (water and electricity not included in winter pricing).